How to import and edit MTS video in Premiere Pro? Adobe Premiere Pro is a timeline-based video editing software application. It is part of the Adobe Creative Suite, a suite of graphic design, video editing and web development programs. Adobe has released many versions editing software in the past, including Adobe Premiere 1.0/2.0/4.0/5.0, Premiere Pro 1.5/2.0, Premiere Pro CS3/CS4/CS5/CS6/CC7, etc. 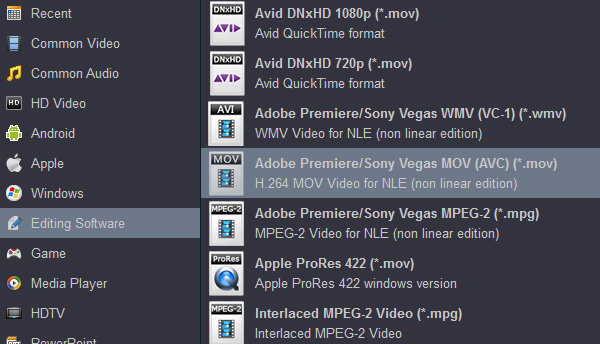 Why I can't import the AVCHD .mts files into Premiere Pro CS6? When you try to load AVCHD (.mts) footage recorded via your Canon/Sony/Panasonic/JVC AVCHD camcorder to Adobe Premiere Pro CS4/CS5/CS6/CC for video editing and customization, you find you can't import .mts to Adobe Premiere Pro due to the incompatibility of video file formats. Even though the latest version of Adobe Premiere Pro claims to support AVCHD videos, you may not import all AVCHD (.mts) files to Premiere Pro for editing for different parameter settings. Read related posts about the MTS to Premiere Pro issue, some guys recommend the Media Browser, so I tried that instead of dragging MTS files into Adobe Premiere Pro. Unfortunately it still does not work. For editing .mts video in Premiere Pro freely, you can convert your MTS recordings to Premiere Pro supported editing video format via MTS to Premiere Pro Converter. Acrok MTS Converter is the best conversion program for Adobe Premiere Pro. Which format can edit in Premiere Pro on Mac and Windows? MOV (AVC), WMV (VC-1), MPEG-2, HDV, DV AVCHD (.mts), QuickTime files, etc., are the file formats that Adobe Premiere Pro can import. So, you can convert MTS video to these video format on Mac and Windows via this MTS to Premiere Pro Converter. If you are Mac user, you can try Acrok MTS Converter for Mac. Here the detailed way to convert MTS and M2TS files to Premiere Pro on Mac OS X is showed. The way to change MTS to Adobe Premiere Pro editing videos in Windows is the same. Just make sure you've downloaded the right version. Click on "Add files" icon to load your AVCHD (.mts) videos you want to encode into this MTS to Premiere Pro Converter tool. Click on the triangle icon of the "Format" to choose the wanted video format from the profile list. Here just take "Adobe Premiere/Sony Vegas MOV (AVC) (*.mov)" as the output format in the "Editing Software" category. Click on the "Settings" button, you will view the Profile Settings window where you can adjust video/audio parameters, like bitrate, frame rate, sample rate, codec, channels, etc. Please note that the the larger bitrate, the bigger file size while the better video quality. If interested, you can also check "Merge into one file" to combine MTS videos into a big one. Click "Edit" menu to do some premiere editing if you need before conversion. Here, you can trim, crop the loaded videos. If you needs, you can add 3D effect onto imported video files. After all the settings, you are able to click on "Convert" button to start MTS to Premiere Pro supported video format conversion. Based on the NVIDIA CUDA technology, you will get the converted MTS videos in a short time. After conversion, click "Open" button to get the converted videos. 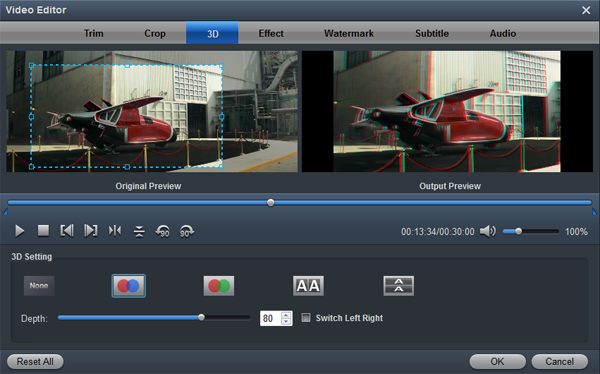 You can import the video into Premiere Pro CS5/CS6/CC for editing without problem. I have used Acrok MTS Converter for Mac in four different forms, and have been very pleased overall. The conversion speed is so fast. I like Acrok product. I can make my short video now.